suzy krause+the skyscrapers: Valencia and Valentine Has A Cover! 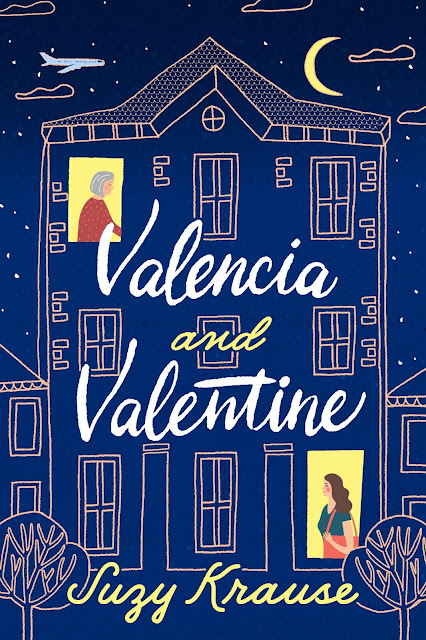 Valencia and Valentine Has A Cover! We've all heard that dumb old saying about not judging the covers of books. It's very old and I think we could retire it. I always judge the covers of books and I always will because that's the whole dang point of covers of books: they're supposed to give you an idea of the style or mood of the book, maybe hint at a character or two, or the setting, or a detail pertinent to the plot. They're supposed to imply genre and they tell you who wrote it and what it's called. Everything is intentional, if a cover is well-designed, right down to the colours and the fonts. If you were not meant to judge a book by its cover, a book would not have a cover. That said, I'm finally allowed to show you the cover of my book, so judge away, people. It was designed by Philip Pascuzzo (one of the designers behind the famous Twitter logo). It's going to be in hardcover and paperback, which is especially exciting to me because Lake Union is known for their beautiful hardcovers and it'll be a dream come true to have my name on one. Isn't it so pretty? I have it saved as the lock screen on my phone so I see it all day every day. Many thanks to Pepco Studios, but also to Lake Union and Alicia and Victoria for all the back-and-forth brainstorming sessions and allowing me to give my input. It was suuuuch a cool process. One step closer to pub day! PS: You can preorder here (or click on the cover above), but I also just wanted to take a moment to add that preordering/buying a book is not the only way to show support to a person who has written one (though it really does help and I'm enormously thankful for everyone who's done this, srsly). Add the book to your to-reads on Goodreads. Request the book at your local library (if all copies of a book are reserved before the title comes out, the system has a way of noticing this popularity and marking the book as one for “more orders”). Same with bookstores. If you happen to be there anyway, I mean. It helps bookstore employees become aware of a book they might not have known about otherwise and maybe they'll read it and maybe they'll like it and then maybe they'll start handselling it, which would be the best.